Want a sneak peak at what's coming in 2016? Visit our Facebook photo album. Now offering pick-up on certain items. and carnival games. Customer pick-up of inflatables or tents is NOT available. Are you having a public event? Not sure what qualifies as a public vs. private event? Check out our public event page for all the details. ABOUT US...Family owned and operated out of Lake County, IL, Bella’s Bouncies is Chicagoland’s premier, full-service party rental company. Whether you’re celebrating a birthday in your backyard or planning a large corporate event, we have the latest, safest and cleanest equipment in the area with rates that are affordable and competitive. Our vast inventory of party rentals includes moonwalks, water slides, concession/fun food items, obstacle courses, photo booths, character trackless train, dunk tanks, mechanical bull, rock wall, Euro Bungee and much more. And there’s no need to shop elsewhere for party supplies because we also offer tents tables & chairs, party favors balloon art and face painting services. Check out our package deals that can be customized to fit your needs. Bella’s Bouncies is fully insured and licensed in the state of Illinois. We deliver to more than 100 cities in the Chicago area and southeast Wisconsin (delivery areas and rates here). We pride ourselves on our punctuality and outstanding customer service. Thank you for visiting Bella’s Bouncies, and please contact us with any questions. We look forward to making your party a success! SAFETY...There have been a lot of news reports recently of bouncers and inflatable games becoming airborne and causing injuries. Please know that none of these incidents have involved inflatable games from Bella's Bouncies. We take every precaution to help ensure you and your guests never experience this type of episode. We want you to have a fun and safe party. That's why we will cancel events if estimated wind speeds exceed 20-25 MPH. It's also why we encourage anchoring all inflatable games with stakes in grass and only using sandbags when a hard surface setup is absolute necessary. Also, we cannot stress enough the importance of proper adult supervision. The recent incident in Lisle was likely a result of improper supervision. It appears as if the slide was overloaded with kids, causing it to collapse. Following the proper usage instructions found on the front of all inflatables could have eliminated this accident. SIOTO, Safe Inflatable Operators Training Organization, trained and certified. 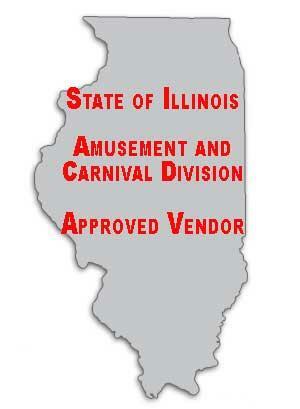 Bella's Bouncies is certified by the State of IL for public events. Party and Event Rentals | 99 Christopher Way | Fox Lake, IL 60020 - This is our office/warehouse. Use this address for mailing or customer pickups only.